I have long stated that when the bull market in precious metals ends and we reach the mania stage, it will be silver's upward paper price movement that will provide the ultimate form of shock and awe. The reason for this is due to simple supply and demand. Throughout history there has always been about 10 times more silver available in the earth's crust to mine than gold. This simple dynamic created a historical gold/silver price ratio that was about 10 to 1 going back thousands of years. For example, throughout history if the price of gold was $1,387 then the price of silver would be about $138. Today that ratio is at 62 to 1 with gold at $1,387 and silver at $22.21. We will come back to that in a moment. Over the next few decades I believe that ratio will find a way to move back to balance. Notice that I use a very long term horizon (decades) when saying that ratio will move into balance, and the reason for that is because it takes years from when a new mine first goes into planning to when the first ounces are pulled from the ground. So what happens if there are investors or industrial producers who want to purchase the silver immediately, and they cannot wait years for when a mine begins to produce? 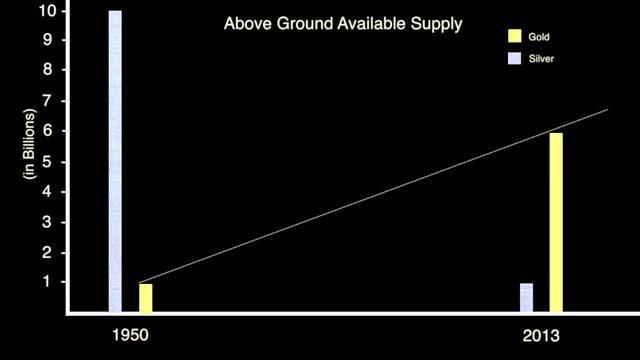 At that point you must look at what is currently available above ground for supply. This is where the story gets interesting. In 1950 the 10 to 1 above ground supply ratio for gold and silver was still in place, which can be seen in the chart below. There were about 10 billion ounces of silver available above ground compared to only 1 billion available for gold. Fast forward to today and something incredible has happened. There is now currently 6 billion ounces of gold available above ground with only 1 billion ounces of silver available. Silver is now 6 times more rare than gold in terms of what is available above ground. This is what is available for both investors and industrial companies to purchase immediately. In addition to the current above ground supply, you must look at the new annual supply which comes from mining, scrap, and government sales. The following supply and demand figures come from The Silver Institute. This new supply is taken off the market through multiple forms of demand, the largest of which is industrial use. The industrial uses for silver range from electronics to solar panels and the number of uses is growing rapidly. For more on industrial uses see the following article from The Silver Institute. The last two, coins and investment, are what you probably think of first when you imagine silver demand, but it is only a small fraction of what takes the total new supply off the market every year. So with new supply being taken away immediately, we are back to the treasure chest of the 1 billion ounces remaining above ground available to purchase. With the current silver price of $22, that means that the entire above ground supply of silver can be purchased for $22 billion dollars. That is a spec of dust in the current financial world we live in. To help put that in perspective, the Federal Reserve is adding $45 billion of new money to financial system every month. Other central banks around the world are engaging in similar programs. A conservative estimate would say that about one quarter of the new money that is created around the world every single month would completely wipe out the entire available silver supply on the planet. China or a large hedge fund could wipe out the entire physical silver supply with a simple keystroke. This is an accident waiting to happen. Tomorrow morning I am going to wake up and purchase silver when the markets open in the United States because sentiment levels are at historic lows. Next month if sentiment levels and prices remain low I will purchase more, and the month after that I will purchase more. My hope is that the artificial and temporary paper price of silver continues to go lower. In fact, I hope it collapses again back to single digits. One morning we will wake up to find out that the enormous amount of paper currency around the world (the size of the water supply in every ocean around the world) was introduced to the physical supply of silver (the size of a small toy boat in a bath tub). At that point you will see a price surge unlike anything you have see in history. When will it occur? I have no idea. Every day it does not is a gift to accumulate more. When the market figures this story out the paper price will have almost no relevance and purchasing physical silver and taking delivery will literally be impossible for a long period of time. Above ground silver is 6 times more rare than gold and the price of silver is 62 times less expensive than gold. Try and think of an asset that is lower in price today than it was in 1980. I bet you have trouble. Silver is currently 60 percent lower today than its 1980 price with 4 times less silver available. Keep accumulating on a steady plan and hope for lower prices. 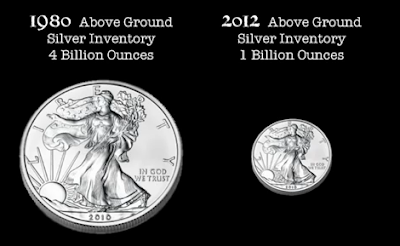 The Fundamentals for Owning Silver in 2013 from Ryan on Vimeo. There are billionaires out there, why don't they just go ahead and buy up half the market?? Or a big company could gain control over silver supply for profit. Or is there something wrong with my logic, or the articles? "...faith is the substance of things hoped for, the evidence of things not seen"
The answer could be had, easily, if you just do a little search; I believe. & in having done so, it is very likely that you would do likewise as per the author advocated. The conviction you would then have will be as quoted above. BTW, Charles Savoie did have much write-up on Ag; particularly from the historical perspective! Yes, they COULD do that but as the Hunt Bros. found out in the early 1980s, there ARE consequences for such actions. When Eric Sprott was asked this question, he replied that he would not do that because he doesn't want to have to look under his car every time he wants to get in it. We can well imagine the reason for that. Well its September and the price of silver is less than it was last year. Can anyone tell me when the surge is supposed to happen? I'm sitting on a couple hundred ounces. To be a bit more accurate, when I first bought the silver it was sitting around $36 CAD, this was last summer. Now its sitting at $19 CAD. I'm not super angry but its starting to look like I'm taking a bath on it. I keep hearing how silver prices are going to soar and now is the time to buy it. Is it still the time to buy it? I would like to purchase more silver but at this rate I'm loosing hundreds of dollars. Yes it is now and going lower, but physical is drying up so I am guessing the premiums will match the price or pass it pretty soon. What do you mean by hardened bulls will throw in the towel? Do you feel that silver wont go back up in price for a while? Testing 123, testing 123 ok? Keep buying it...The lower it goes the more you should buy! Still testing at $16.968US now. Down to $10? I do notice heaps of Monster boxes around at Apmex and others! I can wait till the 23 of Oct. if there is a collapse. 07/22/2015 the price is $14.789 and still going down! Heading to $10? Interesting. Still heaps of Monster boxes, 999999 boxes for eagles and maple at GC alone. Looking at physical silver for many years, I am wondering what people telling us is right in regard to shortages and silver will go to the moon etc. I do suspect that those people would have bought silver at the high of 2011 and wanting to off load to others. Just check out Gainsville Coins and Apmex and you can buy till you heart content. Gainsville Coins just type in 999999 monster boxes for maples or eagles and you can get them no problem at all. Scammer should be in jail. November 2017. Silver Spot almost US$17. All I have been hearing for the last 3 years is how it will got sky high. All the predictions, month by month, and many even specifying a particular date in a particular month, come and go without so much as a flea fart. All the future seers have the excuses ready when their predicted dates go without any bother. Always someone else's fault....price fixing, blah blah blah. Why bother.